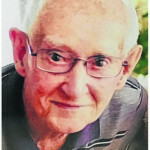 11.2.1925 - 29.03.2019 Devoted husband of Joan Veronica (dec). Loved Dad of Ray, Marie, Janette, Wendy and Jenni. Wonderful Grandy to 11 and Great Grandy to 4. An amazing man who never complained or wanted to inconvenience others and always put others first. 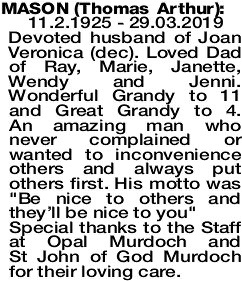 His motto was "Be nice to others and they'll be nice to you"
Special thanks to the Staff at Opal Murdoch and St John of God Murdoch for their loving care. 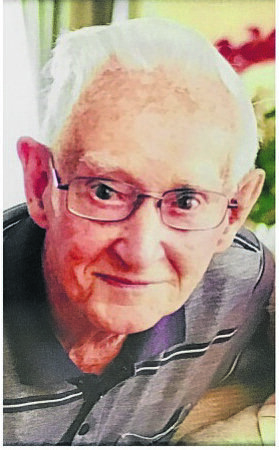 The Funeral Service for Thomas Arthur (Tom) Mason of Opal Murdoch, originally of Sawyers Valley will be held at KARRAKATTA Cemetery, Railway Rd, Karrakatta on SATURDAY (06.04.2019) commencing at 10.30am. 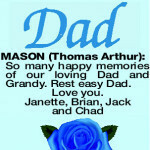 MASON THOMAS ARTHUR So many happy memories of our loving Dad and Grandy. Rest easy Dad. 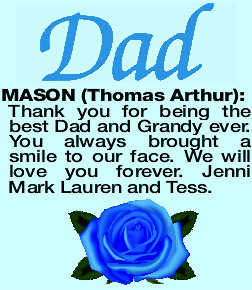 MASON THOMAS ARTHUR Thank you for being the best Dad and Grandy ever. You always brought a smile to our face. We will love you forever. Jenni Mark Lauren and Tess. 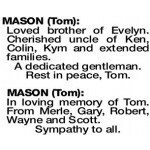 Loved brother of Evelyn. 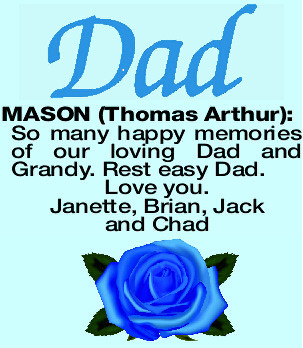 Cherished uncle of Ken, Colin, Kym and extended families. A dedicated gentleman. 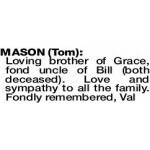 Rest in peace, Tom. 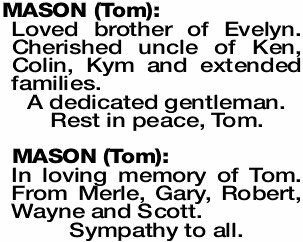 In loving memory of Tom. From Merle, Gary, Robert, Wayne and Scott. 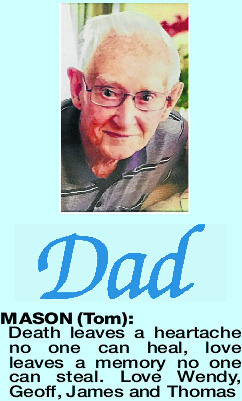 Deepest sympathy to all his caring family.